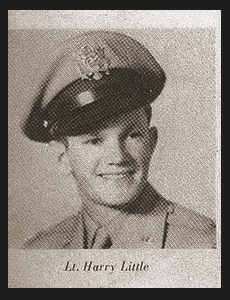 1st LT. Harry E. Little, son of Mr. and Mrs. W. E. Little, attended Frederick and Bisbee, Ariz. Schools; husband of the former Helen Jones. Entered Air Corps in 1942, trained in Santa Ana, Cal., Thunder Bird Field and Williams Field, Ariz.; served in England, France, Germany, Belgium and Holland; was wounded in Germany in Sept., 1944. Awarded Good Conduct Medal, ETO Ribbon with three Battle Stars, the Purple Heart, Pres. Unit Citation with three Oak Leaf Clusters.